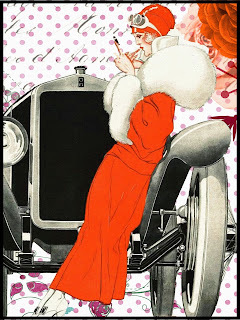 Today, almost a century later, we associate the Roaring '20s with women in fringed “flapper” garb, men in Model T Fords, and crowds drinking prohibited alcoholic beverages in illegal bars called speakeasies. Before the Wall Street Crash of 1929 , the decade was a time of rapid industrial growth, advances in technology, and increases in productivity, sales, and salaries. Consumers were buying more goods and services. Businesses were expanding. For most people, times were good. Your special delivery letter came up to my room (via bell boy) at ten o’clock this morning. Glad to hear everybody is all right and hope David is getting over his cold. [I am unable to decipher the next few lines except for an occasional word or phrase, such as “I don’t want to have to pay for all ?? if I can keep from doing it as we have had trouble with all the ? ?” ] Also got the money order which was “very welcome.” I often feel like I am a failure to the extent that somehow or other I can’t make money enough for our wants and needs. I can sell goods all right but guess something was left out of my make up so I can’t sell enough. One thing that I think handicaps me in the “tough times” I have gone through. It is alright to say that a stretch of “hard times” is good for a man, but it takes its “toll” and there is “something” missing that can’t be replaced. Today like all Sundays is the hardest day of the week. It poured down rain all day yesterday and has been raining all day today. I would judge that there are 200 [unreadable; apparently a reference to traveling salesmen/businessmen] here in the hotel, and the cigar woman (not girl as she looks 45) says our tempers are not improved by having to stay in. . . . This is one of many letters Will wrote from the road. From those letters, I’ve learned that he often ran short of cash during his business trips and had to ask Sarah to send money to tide him over. Did he not plan ahead, or did he spend too extravagantly? Did Sarah hang onto enough cash for just such times, or did she appeal for loans from her more prosperous parents or siblings? The letters offer no clue. It appears that Sarah always followed up by sending money orders. 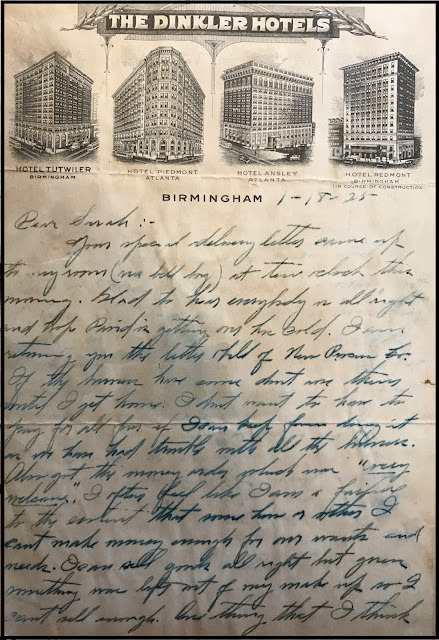 While I have not found her letter in response to Will’s dark mood of Jan. 18, 1925, I like to think she wrote reassurances to bolster his self-confidence. Will and Sarah’s eldest child, Bob, was a student at the University of Kentucky in 1925, which could explain, in part, the family’s financial stress. Bob, too, was feeling a financial pinch and doing what he could to help. 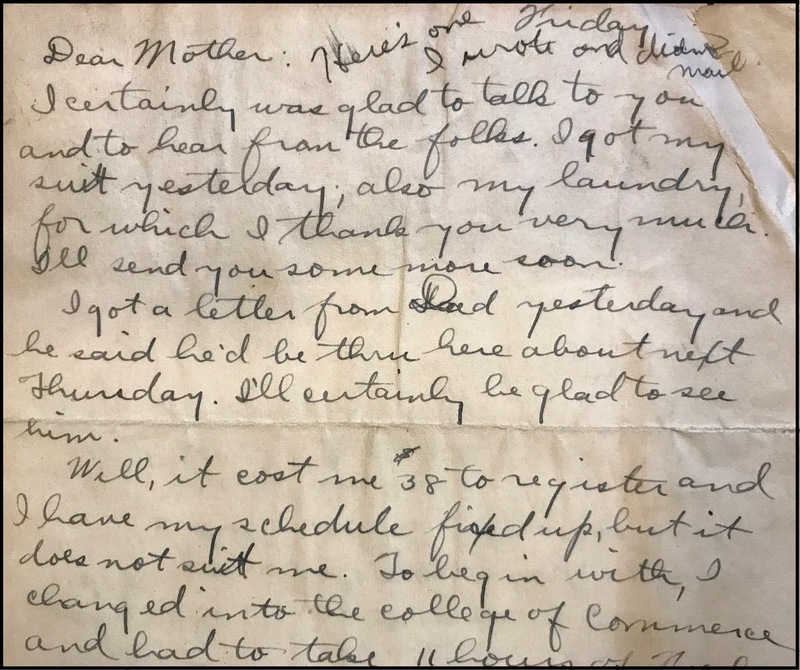 In September 1925 he wrote to his mother: “I bought a pair of pants from a boy for $1 and I think with a little alteration they will make a good pair of school or work pants for Jim.” Bob’s brother Jim was 15 and living at home at that time. Bob was looking for a job in Lexington: “I went to see my man [apparently a prospective employer] and he said it would be in October before he would need me, but that if business did not pick up he would not need anyone at all. All the table waiting jobs are full up, so I don’t know what to do. I’ll talk it over with Dad." In 1925 the Wall Street Crash was still four years in the future, but comments in these and other letters seem to foreshadow it. I’m eager to explore later scrapbooks, hoping to discover how this family fared during the Depression years. Was Sarah Eva Howe Salyers America's First 'Helicopter Parent'? In September 1925, Robert King Salyers started his sophomore year at the University of Kentucky. He lived at the Kappa Sigma fraternity house at 430 E. Maxwell in Lexington. The scrapbooks yield several letters from Bob to his mother, Sarah Eva Howe Salyers, and from Sarah to Bob. What a treat to discover some things in this world are the same 92 years later! In excerpts from one letter (transcription below the image), Sarah pines for Bob and mentions other parents who are missing the young people who left Carrollton, Kentucky to attend college. 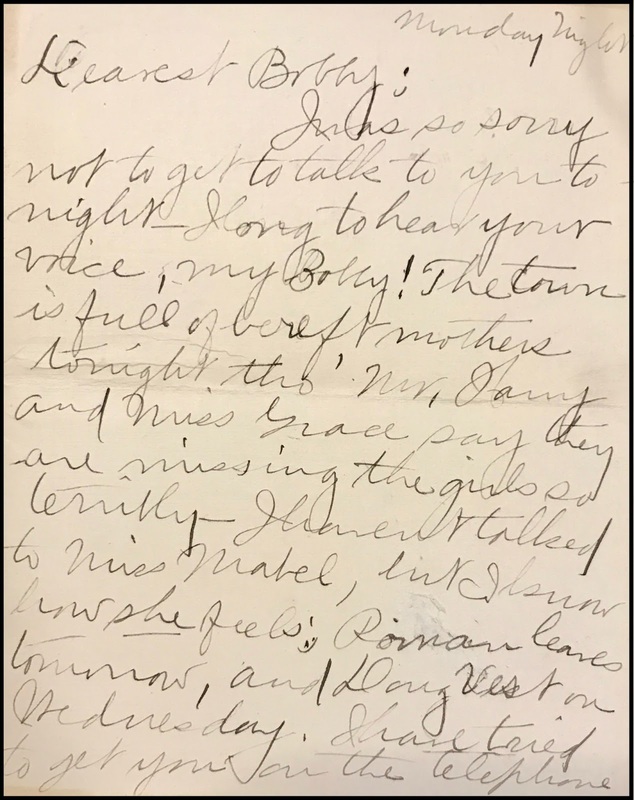 Sarah also offers advice, entreats Bob to keep promises made (with no mention of what those promises were), and urges him to continue with medical treatment for an ailment not disclosed in the letters. I was amused to find that our precocious, inventive, fiercely independent Sarah had become a bit of a “helicopter parent,” today’s definition of one who hovers over a child to the point of micromanagement. I was so sorry not to get to talk to you tonight –- I long to hear your voice, my Bobby! The town is full of bereft mothers tonight, tho. Mr. Harry and Miss Grace say they are missing the girls so terribly –- I haven’t talked to Miss Mabel, but I know how she feels; Roman [Browinski, a 1923 graduate of Carrollton High and Bob’s distant cousin] leaves tomorrow, and Doug Vest on Wednesday. I have tried to get you on the telephone at least six times! Especially when Roman was here at dinner yesterday, and again today at dinner, so you could talk to Giltner [possibly surnamed Salyers; another distant cousin]. I’m afraid you were cold tonight, without your covers. I sent them today; I hope you slept in your bathrobe and put your overcoat over you!
. . . [Referring to making pumpkin pies] I’ll save one till you come home, or perhaps I can send you one in a box. Please write and tell me about everything. Can’t you write me a letter as long as the ones you used to write to little Thomy? You don’t have to write [those] any more. Please don’t put off the inoculation and lose the effect of the first! Please tell me about the courses you are taking, what studies, etc. About the [Kappa Sigma] House, and what boys are there. Don’t forget what you promised me to do –- and don’t forget to go to church.
. . . I got my suit yesterday, also my laundry, for which I thank you very much. I’ll send you some more soon. I got a letter from Dad yesterday and he said he’d be thru here about next Thursday. I’ll certainly be glad to see him. Well, it cost me $38 to register, and I have my schedule fixed up, but it does not suit me. To begin with, I changed into the college of commerce and had to take 11 hours of freshmen requirements which I did not have last year. I have college algebra, 3 courses in economics (3 hours each), psychology, military science and 2 hours of psychology lab, every Tuesday.
. . . We have all of the old boys back, except the ones who graduated, and ten good pledges. There are 24 living in the house now. Everything looks good for a big year. Give my regards to everybody. I wrote a check on you for $3.50 and perhaps you had better send me $7 or $8 as I still have some books to get. Books cost $5 apiece or thereabouts once in a while $2.50 or $3. I am not going to write any more checks now. know right away so you can come up to some other game if I can’t get seats for the other. 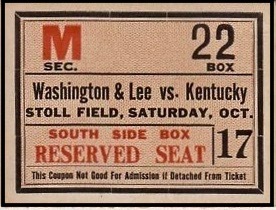 Really, the best game will be the one with W&L [Washington and Lee] this Saturday. . . There is one with Sewanee the next Saturday and one with Tennessee on Thanksgiving – the Homecoming day. Maybe that one will be best.
. . . I am enclosing a clipping [gone now from the scrapbook] announcing the pledging of the SuKy Circle, considered by many the foremost honorary [fraternal organization] on the campus. . . . To make a long story short, your little boy was among the lucky ones to be pledged at the exercises tonight. I have worked pretty hard for it but now I realize it was worth it. I have been to church both Sundays, once at the Presbyterian church and once to the Baptist. Will go to Park [a Methodist church] this Sunday. Sarah, an active member of the Carrollton Methodist Church from childhood, must have been pleased to read that!